A plush red Rhône boxed wine from an organic family estate, a fantastic value [even with a price tag a bit higher then most boxed wines, it still averages a very reasonable $9 a bottle]. Wineberry was founded in 2001 by Eric Dubourg, who hails from a winemaking family in Bordeaux. A boutique importer and distributer, they source their wines from leading estates and artisanal producers. 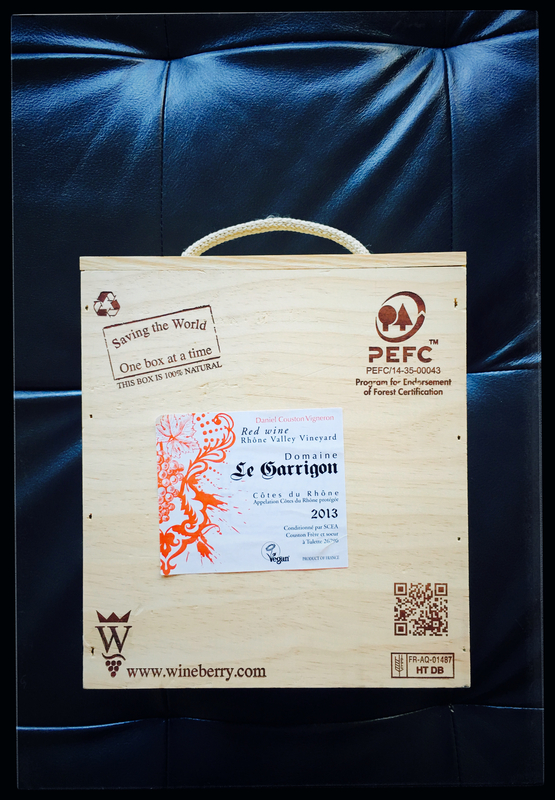 By developing sustainable, innovative packaging, they are able to reduce the carbon footprint and provide high quality wines at affordable prices. Estate: Family owned and operated by siblings Daniel and Marie-Françoise Couston, Domaine Le Garrignon was established by their grandfather in 1919. The 200 acre estate has vineyards that stretch from Tulette to Visan in the Côtes du Rhône appellation of eastern France. Certified organic since 1997, the domaine produces AOC, Côtes du Rhône as well as Rhône villages wines. The vineyards are known for their clay and limestone soils, along with traces of the renowned, smooth Rhône pebbles. Winemaking: With an emphasis on respecting both nature and humans, the organic approach is carried all the way through to the winery. Wines are crafted without the addition of any chemicals or enzyme animal products, and only naturally occurring wild yeasts are used during fermentation. Grapes were sourced from vines 15-45 years old. Aged in cement tanks for 10 months. Vegan. Tasting Notes: Dark garnet in colour with aromas of dark berries, wild flowers and hints of oak. Black cherry, red currant and raspberry notes glide along an undercurrent of cigar box spice. Grippy tannins, whispers of smoky oak, and a velvety finish balance and focus each sip. How long did it take to drink? not long, it was in the fridge for a little over a week. i drank it on evenings when i needed to catch up on reviews so didn’t want to open a new bottle, and for hockey nights at the rink.